Updated with new Readmes loose in the main zip. Please note that the installed Readmes are the old ones and should be replaced by the ones in the zip. 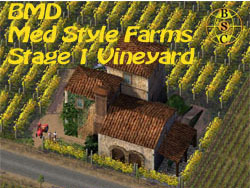 A set of 18 farms - 6 for each growth stage - plus new fields to give your areas that Mediterranean look. There are four installers in the zip and each has its own Readme with details of dependencies.